When I’m out an about I always try and have a notebook and pen with me, it’s not necessarily something I use all the time and it’s easy to take notes in phones these days but there are times when you just need to be able to scribble something down. A plain notebook is also good as you can sketch and doodle away to your hearts content. Now I’m not a drawer, much to my frustration to be honest, as I’d love to be able to sit down and sketch things well. However since my kids were little I’ve always had pens and paper handy and one of them in particular is always happy when creating images. 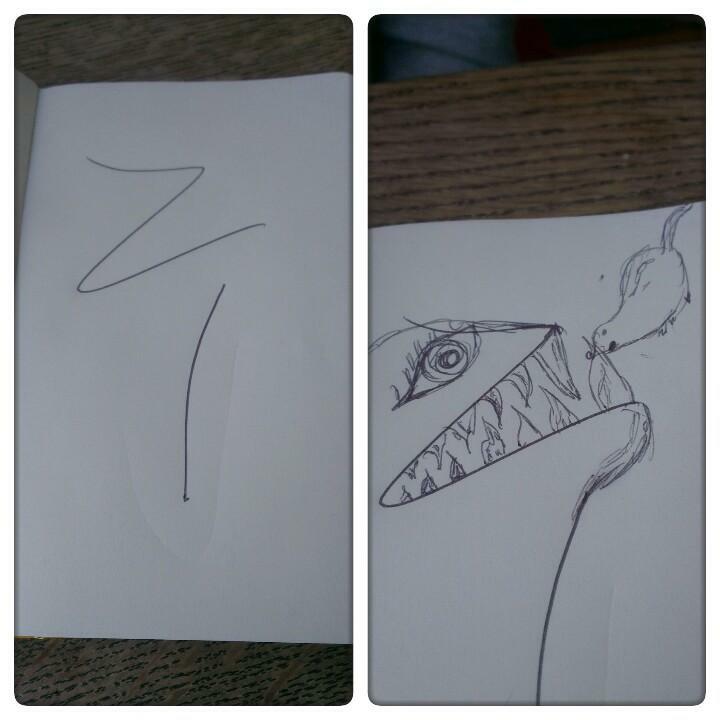 One of the ways we play around is by playing the squiggle game which is a perfect way to pass the time and something we were doing yesterday while waiting for our lunch to be delivered while having an afternoon out. The concept is simple, make a squiggle on a page and then the other person has to turn it into something. I’m not very good at this but my daughter has consistently been able to see an idea really quickly and turn the squiggle into something cool. The image above being a classic example my squiggle on the left and a couple of minutes later she has turned it into this glove puppet monster.